Question: Does my child’s trumpet mouthpiece contain unsafe levels of lead? Answer: In most cases, yes. Only one of the mouthpieces pictured below has no lead. Read more of my posts about trumpets here. For context: the amount of lead that is regulated and considered **unsafe** in a new/modern item sold and intended for use by children is 90 ppm lead or higher. The premium, golden Monette brand mouthpiece pictured below (and made right here in Oregon!) was the only one of the five that I tested that was “ND” (Non-Detect = negative) for lead with an XRF Instrument. To learn more about XRF Testing, click here and here. What this goes to show is that there ARE responsible manufacturers out there and there ARE #SaferChoices to be found! Read more of my musical instrument posts here. Also of significant interest: my son’s trumpet is a 1959 Selmer “K-Modified” (the same as was used by Louis Armstrong and very popular among many of the jazz giants of the day) and it tested negative for lead in the lacquered-brass body and bell of the trumpet! So even back in 1959 they were already making and using unleaded brass, in addition to the high-lead brass alloys that predominate today (at least they used unleaded brass in the case of the particular 1959 Selmer K-Modified trumpet I tested). I’ll be curious to do some more research on this and see if I can find out whether or not the actual mouthpieces that were manufactured back then were also lead-free (and if so, when things shifted to the silver-plated leaded-brass alloys found on most of the popular instrument mouthpieces today)! Click on the image below to see the Facebook post and check out the very interesting exchange in the comments! As of this moment the post has had 97 shares and a reach of 11, 294! I never expected this to be one of my most popular posts! Stay safe out there and thanks for reading and sharing my posts. Just using science to discuss a potential problem. How doesn’t this make sense? It’s pretty straight forward to many other people, including myself. does the plating protect the user from lead in the brass? Yes it’s true that most brass contains trace amounts of lead to facilitate machining, there is little to absolute zero transference to the body, even if the plating is worn from the contact areas. Even repair techs and employees of instrument manufacturers that are tested regularly have no significant or abnormal levels of lead in their system. The mouthpiece should be chosen ONLY for it’s comfort and performance with the individual playing the instrument!! Absolutely NO need for the hype and hysteria regarding lead contact with horns and mouthpieces!!! Has ANYONE tested the exterior of any horn or mouthpiece, raw/lacquered/silverplated for ANY trace of lead? Doubt it! I know that my friends with the Jazz at Lincoln Center orchestra are quite concerned about Lead in their trumpet mouthpieces and have specifically chosen Monette or Giddings because of those concerns. The old adage “know better, do better” applies, especially if we are talking about instruments that may be used by children. The standards set for what is considered to be an unsafe level of lead in the blood in an adult male who works in an industry that might expose him to lead is much too high to be protective of human health. The current standard is either 25 micrograms of lead per deciliter of blood or 40 (depending on which standards you look at.) Long term negative health impairments have been shown to be caused by blood lead levels at much lower levels than those industry standards (BLL 2.0 and below). So if an adult was told his level was “normal” or “negative” or “within safe levels” that is likely not the case from a health protective perspective, but only from an industry perspective. As always, please let me know if you have any additional questions. first of all please excuse if my English is not perfect. Mouthpieces are made of “alloy 360 free machining brass” which is 3 percent lead. The lead allows for better machining surfaces, tool life. Silver plating seals the mouthpiece. Gold plating like your monette is actually silver plated and then gold plated over the silver. Trumpets like your selmer are made of leadfree brass because they are not machined.. the valve casings however are machined and usually a brass with higher copper content instead of lead content because the need to resist wear. Your k-modified does however have an very large amount of lead in it because all of parts are held together with solder that is 50 percent lead. That is far more lead than would be on the surface of about 1000 mouthpieces. If your deveined is telling it has no lead, then your system is horribly flawed. So much for your “science”. Learn more, ask questions, be responsible. In student instruments (especially in school band programs, which are often underfunded) with heavy usage the plating is often wearing. Most of the mouthpieces I have tested since I posted about this originally have been positive in the 30,000 to 40,000 ppm. I hesitate to write you, because I worry you will take your son’s trumpet away. But your son’s trumpet certainly contains lead, in the solder that holds it together. Band instruments didn’t start switching over to lead free until the early 2000’s. Before this, all of the major manufactures used solder that was around 50% lead. Additionally the machined parts of the trumpet likely contain less than 1% lead, like the mouthpieces, as they add it to the brass to make the parts machine better, and more economical. The guidelines set for children’s toys are under the assumption that kids are going to eat or swallow it, assuming your son doesn’t manage to eat his trumpet or his mouthpiece, he should be fine. Additionally the silver plate effectively seal the mouthpiece protecting him from any lead contact. But I’m pretty confident he would have to eat an entire mouthpiece before he suffered any ill effects. 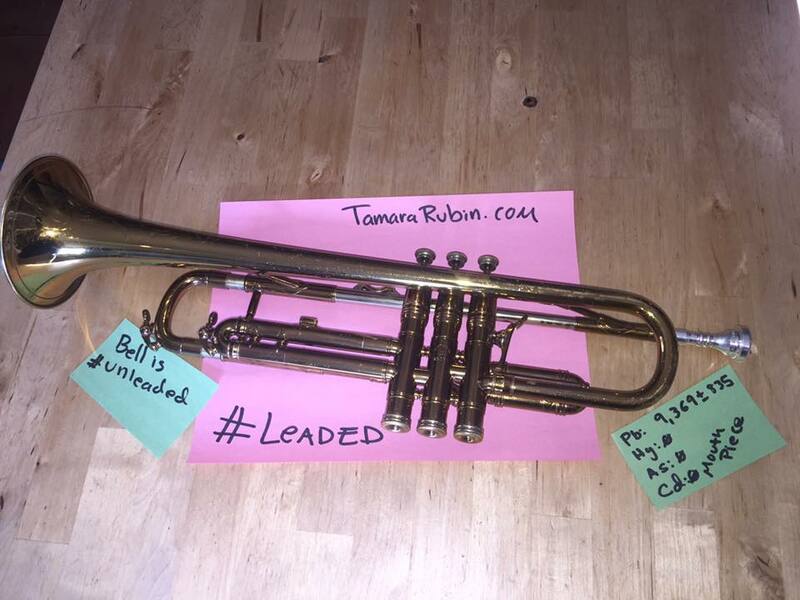 I repair band instruments professionally, and get my lead levels checked every year, so I’m pretty sensitive to the dangers of lead, but I have no hesitation playing or letting any child play a mouthpiece in good condition. I have thoroughly tested his trumpet and now that we have replaced the mouthpiece with a lead-free Monette it is negative for lead in any components that touch his mouth and hands. His trumpet is from the 1950s and it does not have lead in the body as it is important for the bell to be lead-free in order to have good tone. His is the same instrument (same model) used by Louis Armstrong. Please see my response to other comments here in this thread for additional information about concerns for blood lead levels in adults who work with lead and leaded brass in their industry. I know your son’s trumpet I’ve worked on a bunch just like it. They all have lead in the solder joints that hold the pieces together. It’s easy to tell it’s lead solder, because it has the lowest melting point of any solders. So test the spots where the braces and tubes connect. Are there any documented cases of brass musicians actually having higher lead levels due to their equipment? Are there any documented cases of brass musicians having health problems associated with lead exposure from their equipment? Hi Charles, that is a great question. I see; the only possible attribution is due to using an unplated mouthpiece. If one is using a plated mouthpiece, it seems like a non-issue. Do you have any thoughts or information as to other heavy metal exposure effecting health, namely zinc, copper, and nickel (the constituent metals of brass)?